Growing up in the latter part of the great depression and into the war years, we were fortunate to get one present at Christmas. Many families got none. We would think about what we wanted all year. I wanted a Buddy L dump truck. Times were tough and money was tight and my father would often say if he had an extra dollar in his pocket, it went to buy nets. We kids didn’t know any different and thought with all the suffering in the world due to the war raging everywhere, we were lucky to be living in Gimli. One Christmas during the war we received a family present. A 500 piece puzzle. It was a picture of a Canadian Corvette. This was Canada’s answer to the U Boat menace that was sinking ships in the North Atlantic faster than the ship yards could build them. It became world famous for its speed and killing efficiency. As was the custom, all the family including grandparents would gather at our home for the traditional Christmas dinner. It seemed to us kids that the dinner and good wishes would last forever. When the magnificent dinner was over and the dishes washed, the guests went on their way to their respective homes. Then dining room table was cleared and the puzzle spread out. Everyone looking for pieces that matched – sometimes pieces that you didn’t think would fit came together unexpectedly. We must have broken up that puzzle and put it back together a 1000 times. We never grew tired of fitting in each piece. It was a family thing. My mother, Annie, was a puzzle maven, spotting pieces with a similar shade of color or a matching bit of ink with uncanny speed. She would patiently tell the grandkids – if you just keep trying to connect pieces, eventually it will all come together. I would occasionally place a piece in one of her puzzles but hadn’t done an entire puzzle in years. I am not sure why, but one day we put up a card table and liberated one of Annie’s favorites – a 1000 piece picture of dozens of old post cards. After several weeks of insisting there were pieces missing, I am proud to say we finished the assembly. After this herculean task, I was indulging myself and looking at real post cards at a recent flea market show with an old friend, a Royal Canadian Navy WW2 veteran. We came across a post card of a Canadian Corvette. He immediately started reminiscing about the hazards of wartime duty. He was on the Murmansk run on a Corvette. This voyage meant they had to constantly chip away at freezing ice since the short length and shallow draft made the Corvettes bounce around like corks. Too much ice on deck and the Corvette would be top heavy. Chipping ice on deck and at the same time keeping an eye out for the German U Boats – if you were torpedoed you had no chance in the frigid waters. The voyages were necessary for the Allies to supply Russia with war materials so they could keep up the pressure on the German’s on the Eastern front. Sometimes puzzle pieces come together in the most unexpected ways. Each piece holds a small but vital part of the grand picture. When they come together, when we come together, we sometimes make unexpected connections and in those moments, maybe we are lucky enough to catch a glimpse of the larger picture. 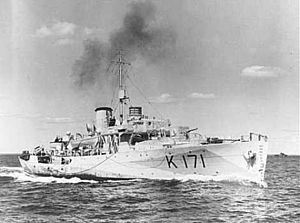 This entry was posted in Uncategorized and tagged Canadian Corvette, HMCS Kamsack, Ken Kristjanson, Murmansk, puzzles, Royal Canadian Navy, UBoat by william. Bookmark the permalink. adding his stories to your blog – he’s a great storyteller. As always, when I click onto your blog, I read until my eyes cross. overdose, so I probably won’t.